We came into Antigua after a five-hour shuttle ride from El Tunco, El Salvador that included the obligatory bureaucratic wait at the Salvadoran-Guatemalan border. Inevitably Melanie and I were some of the last to be dropped off at our hotels, bouncing along the Antiguan cobblestones as fellow travelers were left to their respective hostels. Some of course hadn’t bothered to reserve anything in advance. I’m all for the carpe diem, impromptu spirit when it comes to travel, but not when it screws with my eating schedule. I’ve been in a bit of a funk. Three weeks ago I was hit by a car, crashed a mountain bike and sent to surgery to fix some arteries with cow parts. Suddenly my travel schedule was wiped clean and I had to give up physical activity for six weeks. While forced to the couch, my Costa Rica anniversary came and went. Like any other anniversary of a momentous occasion, it felt impossible that a year had already passed. I found myself missing Costa Rica, Central America, Latin America like a normal person might miss a significant other. If there’s a train in a city, I will figure out a way to ride it. Such is my love for alternative transportation*, specifically rail transit. Naturally I was intrigued after reading about Panama City’s new rail system with an Estación Iglesia del Carmen just blocks away from our hotel. While I have no problem hopping on a train and getting off at a random stop to see what happens, I generally prefer some kind of loose plan. The plan was to get to Parque Natural Metropolitano — a 265-hectare green sanctuary just on the outskirts of urban Panama City. There was no direct train stop for the park, but we were able to piece together our own route by getting off at Albrook — a mix of a transportation hub and mall — and walking the rest of the way. The train itself was as impressive as any other in a 21st Century transportation system. Sleek sliding doors, bright and welcoming colors, and plenty of space for traveling Panamanians wisely choosing to avoid bumper-to-bumper traffic. Though we very well could have been the first to use the train to get to Parque Natural, it was certainly better than getting into a taxi choking on its last breath. Parque Natural itself proved to be an excellent retreat from urbanity, perfectly accessible from downtown and some of the western neighborhoods. Trails varied from gravel to dirt as they rolled with very modest elevation gains. This wasn’t about backpacking, this was about getting a bit of fresh air within reason from the city — something I appreciated about Panama City since I’ve never been a fan of the “either/or” choice. That being you can either live in the middle of nowhere if you want green space or you can get the amenities of a city, but without a trail to hike. Something we personally enjoyed was discovering Parque Natural’s faraway partner — our very own Cleveland Metroparks. Turned out a specific bird species migrates back and forth between the two park systems. Plus Cleveland has its own bit of canal history — though realistically incomparable to Panama — so the two struck a partnership. Cleveland truly is everywhere. Next was what Melanie had most anticipated (and I a normal, reasonable amount) in our visit to Panama City — the famous canal itself. The amount of material created by the Panama Canal — its construction, politics, and aftermath — could probably stretch the length of the actual canal and then some. PBS has a good documentary on it and David McCullough hit every detail in The Path Between the Seas*. Here are the main takeaways. The French tried it first, failed and then we did it. U-S-A! U-S-A! U-S-A! It was actually all much more complicated than simplistic, nationalistic narratives (such as the one above) offer. A lot of people died and racism dictated the harsh treatment of immigrant West Indian workers to whom the canal owes its life to. President Carter wisely signed a treaty with President Torrijos in 1977 to hand control of the Panama Canal over to the Panamanians on December 31, 1999. Y’know, because it’s Panama and not the United States. Panama is currently expanding the canal to take on larger hulls and it remains under construction as of this writing. After reaching Colón, we made our return for Panama City by car in order to stop at a few sites along the way. First was the Gatun Locks where we spent about an hour watching ships that made the average sailboat look like a thumbtack. Throngs of tourists marveled over the modern wonder as guides spouted off information in English, Spanish and French. Further along, we continued to a viewpoint where expansion construction was well underway. Once construction is completed, the area would turn into another stop along the Panama Canal viewing trail. We ended at the more popular Miraflores Lock near Panama City. But given the late hour and evidently different water conditions, ships had been halted for the time being. Our two final stops came at the Palacio Presidencial back in Casco and then at Panama Viejo. Palacio Presidencial sat on the northern edge of Casco, overlooking the Pacific Ocean. Its main feature, besides the typical splendid architecture and paintings that come with presidential quarters, included the two herons strutting around freely in the main courtyard when entering the building. Herons were first brought in 1922 and have remained a staple of the palace ever since, even giving it the name of Palacio de las Garzas. We fittingly ended where Panama City as we know it today technically began — at Panama Viejo where the original location of Panama City was burned to the ground in 1671 by the Englishman Henry Morgan, known as a pirate to the Spanish and descendants of its historic settlements. Reconstruction started further south in Casco as it was believed to be easier to defend. 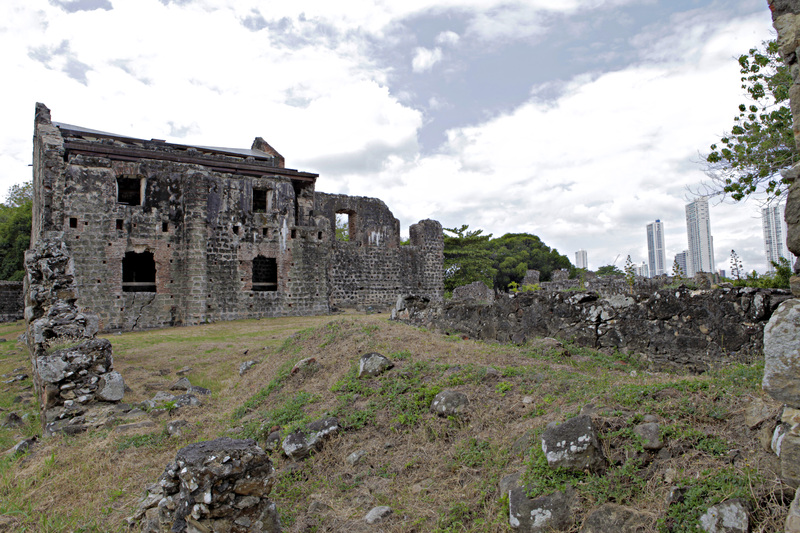 Today the area, north of downtown Panama City, shares World Heritage Site honors with Casco. Walking the grounds of the fallen city was actually quite remarkable. Much of the original framework remained intact — dirt footpaths, stone towers and all — accompanied with the fresh air that tends to circulate in an unpopulated town, much less ruins. Beyond the ruins, the hyper-modern Panama City skyline stood perfectly visible with scaffolds surrounding new skyscrapers under construction. While Panama’s history may prove rocky — from its beginnings in Panama Viejo to the Noriega and U.S. invasion that decimated an already severely impoverished neighborhood — it would seem that the future of La Ciudad is as bright as its nighttime sky. My only hope as I left was that the Panamanians in El Chorrillo and other similar barrios would be brought along for the ride. Disclosure: Hilton Panama provided a discount on the hotel and the Panama Canal tour was provided by Terramar Destinations. As always, all opinions are my own.